Planning a trip… It can be a nightmare! From the flights, to the car parking, to the airport hotels… it seems never-ending. Luckily we like hard work here at UKACP so we have taken all of this hassle off your hands. We make it easy for you to sort out all aspects of our airport experience, including booking a Liverpool Airport hotel. We have a great selection of hotels for you to choose from. Simply enter your details into the search box and we will present you with the best options for your needs specifically. We provide you with all of the information you need to make a decision. This includes a list of facilities, walkthrough videos and much more. You will also be able to make some great savings as well. Who doesn’t love a good discount? Search now, pre-book and save… it’s never been easier. You can even book a Liverpool Airport hotel with parking. It doesn’t get much more convenient than that! Calling all Beatles fans! 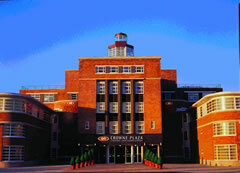 There really is only one place you can stay when you are flying from Liverpool Airport and this is the Crowne Plaza. Great hotel, but that’s not why we are recommending it. It’s actually got a special place in Beatles history. It was converted from the original Liverpool airport terminal where the Beatles made their historic return from the USA. We don’t just expect you to stand in awe though! There is plenty to keep you occupied, including badminton, tennis and squash courts, a mirrored dance studio and a huge gym. There are several family friendly Liverpool Airport hotels for you to choose from. Holiday Inn Express and Hampton by Hilton are just two options. You will enjoy a comfortable stay, with friendly staff and a delicious breakfast. Both have free wifi and excellent facilities. The Hampton by Hilton hotel has a great restaurant which is inexpensive and includes a childrens menu.. always handy if you want to save a few quid and for those fussy eaters! Are you flying at silly o’clock? Holiday Inn Express do their best to accommodate this by serving a free breakfast from 4 am until 10 am. In terms of convenience, you can’t get much better than Hampton by Hilton, which is 0.1 miles away from the airport. Other hotels located less than a mile from the airport include Premier Inn and Holiday Inn Express Liverpool John Lennon Airport. The Premier Inn have specially adapted room for disabled guest which include a wet room. Don't forget that if you decide not to stay in a hotel the night before you fly you can still save money on our Liverpool airport parking packages. We will always save you anything from 15 to 60% compared to the car park gate price.